Ghana Football Association Vice President George Afriyie has been sacked. This comes on the back of being fired as the Chairman of the Black Stars management committee in the first week of April. 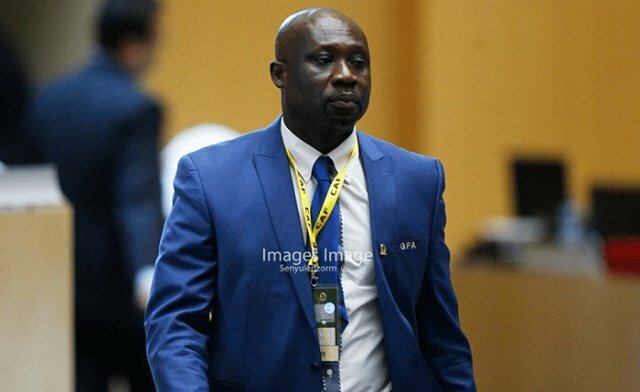 Afriyie, who has been second-in-command to Kwesi Nyantakyi for three years has been relieved following a meeting of the GFA executive committee. Breaking News: Mr George Afriyie has been released of his duties as the Vice President of the @ghanafaofficial following a meeting of the Executive Commitee. A new Vice President will be announced soon. A new Vice President will be appointed in the coming days. The 50-year-old was appointed by Nyantakyi in 2015. Per the GFA statutes in accordance with Article 30.3, the president has the right to appoint his vice. Although a reason was not revealed, it’s believed the decision is due to George’s interest in the GFA presidency. The bankroller of second-tier side Okyeman Planners become the first person to officially reveal that he will contest the presidential elections in 2019. According to Afriyie, his decision was as a result of Kwesi Nyantakyi claiming that he would not seek re-election. However, sources close to the GFA President have it that he was unhappy with Afriyie's decision especially because his (Nyantakyi's) first wife was at the ceremony where Afriyie declared his intentions. The presence of Mrs Nyantakyi was interpreted as an endorsement by her husband, something which, clearly, was not the case.